Eastgroup Properties, Bank of Nova Scotia, and Simmons First National all lifted their payouts last week. Labor Day has come and gone, and with it a late August that was light on dividend raises. Now that we're in the new month, the pace of distribution hikes from the market's companies should pick up somewhat as we ramble toward the new earnings season. Real estate investment trust Eastgroup Properties (NYSE:EGP), a once-a-year dividend raiser of late, has declared its latest increase. The company's quarterly payout will rise by 3% to $0.64 per share. Increased demand for the industrial facilities the REIT specializes in has lifted the company's results and helped move its share price to all-time highs. In the company's second quarter, leasing volume also notched a new record, pushing revenue up by almost 10% on a year-over-year basis (to nearly $68 million). Funds from operations, the most critical profitability line item for REITs, rose 12% to just under $36 million, or $1.05 per share. There's no reason to doubt that demand will slack anytime soon for industrial properties, so Eastgroup is forecasting continued growth in its results. Full-year FFO is anticipated to hit $4.23 per share, a 5% improvement from the $4.02 of 2016. REITs are essentially required to pay out nearly all of their net profit in the form of shareholder dividends, so their payout ratios are usually quite high. It's more accurate to compare the dividend to FFO; on that basis, Eastgroup's payout ratio for its new dividend against Q2 FFO stands at a very manageable 61%. Eastgroup will dispense its newly raised dividend on Sept. 29 to stockholders of record as of Sept. 15. 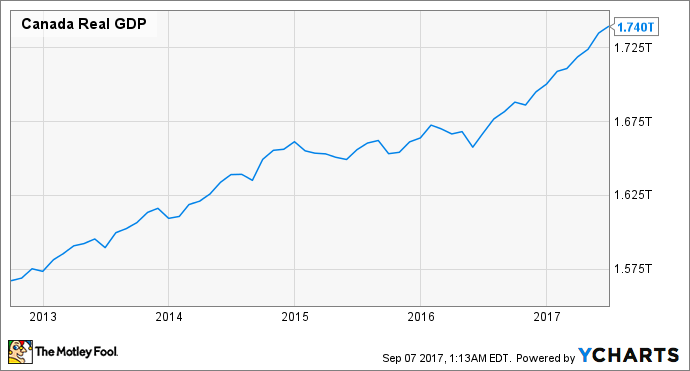 On the current share price it would yield 2.9%, comparing favorably to the present 1.9% average of dividend-paying stocks on the S&P 500. Storied Canadian lender Bank of Nova Scotia (NYSE:BNS) -- also known as Scotiabank -- has raised its quarterly dividend to 0.79 Canadian dollars ($0.64) per share. That amount is 4% higher than what it was paying before. Bank of Nova Scotia is not only an important Canadian bank; it's also a player on numerous international markets such as Mexico, Peru, Germany, and France. This helps hedge the company against bumps in the national economy, a concern at the moment as numerous commentators are expecting a sharp downturn in the housing market. The bank managed to improve its business both at home and abroad in Q3. As a result, total revenue rose by 4% on a year-over-year basis to almost CA$6.9 billion ($5.6 billion), on the back of loans that grew by over 5%, and despite a 2% slip in deposits. Net income increased by more than 7% to just over CA$2.1 billion ($1.7 billion). Bank of Nova Scotia's main economies are forecast for mild to encouraging growth. In the latter category is, fortunately, Canada, which it estimates will see a 2.9% rise in GDP this year in spite of those housing market fears. So the immediate future looks good for the north-of-the-border lender. And its dividend is well within its means, as the raised amount mashed against Q3 net profit results in a payout ratio of 48%. Bank of Nova Scotia will hand out its next dividend on Oct. 27 to shareholders of record as of Oct. 3. It would yield a theoretical 4.1% on the most recent closing share price. Meanwhile, in U.S. banking, small Arkansas-based lender Simmons First National (NASDAQ:SFNC) is about to bump its quarterly distribution $0.01, or 4%, higher to $0.25 per share. In sharp contrast to a peer like Bank of Nova Scotia with its global reach, Simmons is strictly a regional operator. It's been in business since the early 20th century, and over that time has proven to be a fairly solid and reliable earner. In its Q2, for example, total revenue grew by nearly 10% on a year-over-year basis to almost $120 million, thanks mainly to an expansion in loans. The company is also a busy and active acquirer -- costs related to its latest buy, that of Tennessee-based Hardeman County Investment, dampened profitability. Net income rose only marginally in Q3 as a result, to just over $23 million. Simmons First National has done well recently with its acquisitions. In only the past few years it's bulked up its asset base, more than doubling it from the end of 2012 to 2016. 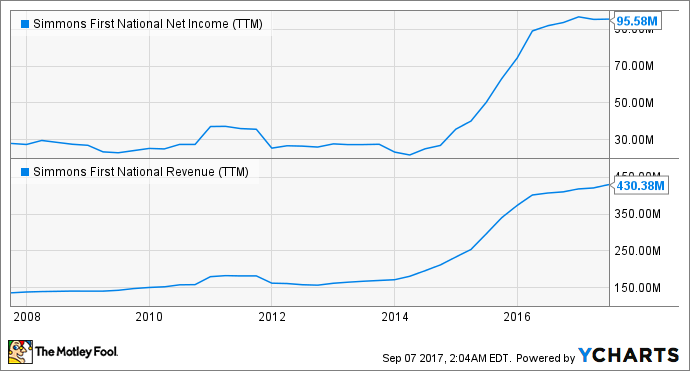 Across that stretch, revenue and net income have risen dramatically -- it obviously knows how to make an acquisition work. I think that habit will stick, I'd expect more asset buys, and as a consequence the new dividend will be at least sustainable going forward. 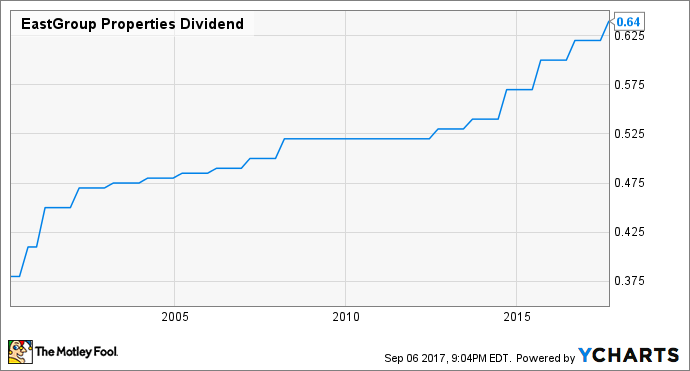 Simmons' freshly raised dividend is to be paid on Oct. 2 to investors of record as of Sept. 15. The company's payout ratio on the new amount is 35%. At the current share price, that $0.25 per share would yield 1.9%.